UK-based agricultural machinery firm McConnel has unveiled a range of new products and Power Arm enhancements. McConnel said the key benefits of its new 6.5m Tele-VFR arm-set are improved arm geometry, increased strength and additional head angling, with the new design increasing reach in all direction while improving close-in cutting performance. The strength and durability of the arm are enhanced by the use of a larger box section, Strenx steel and wider 60mm pivot pins, the firm said. The head angling linkage has also seen significant change with the repositioning of the angling ram. McConnel said the new layout results in a compact design, and neat protected hose routing, while providing the attachment with greater torque and consistent angle rotation. The REVOLUTION control system has been overhauled with a new compact digital display, new operating system, soft-touch armrest and additional new features such as the ability to quickly change between pre-set hedgecutting to verge mowing setting at a touch of a button. The system can now also be specified with a new mini joystick control for true fingertip control. 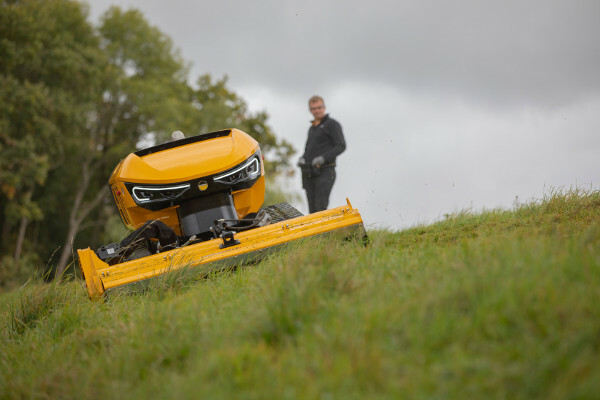 McConnel said its new ROBOCUT (pictured) range ‘transforms’ remote controlled slope mowing with a new ground up design and the latest technological advancements. It said the new the RC56, RC75 and RC28 models provide more power, an advanced feature set and a revolutionary control system for greater output, safety and control. New engine choices have been developed in a partnership with Hatz GmbH specifically for working on steep gradients of 55 degrees, with increased power. A new common chassis design provides a lower centre of gravity and 50/50 weight distribution for maximum stability and control in challenging terrain. For the first time GPS Autosteer is available, developed in conjunction with Trimble, enabling operators to control precise cutting to an accuracy of 25mm from up to 150 metres away, eliminating overlap with each pass and increasing productivity.